This is a ‘sponsored post’ (kind of). I basically STALKED UPPAbaby after months of researching strollers that would work with 3 kids under 5, so that they would send me one to review. So yes, I did get my amazeballs UPPAbaby VISTA double stroller in exchange for this post, BUT I practically begged for it and would spend every single penny on it if I had to. That being said, all of the thoughts and opinions below are 100% my own. I am a self-proclaimed over-researcher. And when it came to finding the perfect double stroller for our needs as a growing family, I went a bit overboard. I was determined to find the ‘right’ stroller for a newborn, 18 month old and 4 year old that could fit our needs now and down the road. I joined a Facebook group about strollers and practically stalked all of the chats regarding double strollers with a ride on option for a third kiddo. I went to Buy Buy Baby and test drove stroller after stroller. I polled friends and stopped total strangers on the street to ask about their stroller and how they like it. After narrowing down to a couple different brands, I was beyond ecstatic to get the opportunity to try out the UPPAbaby VISTA…and three months in, it has not disappointed. 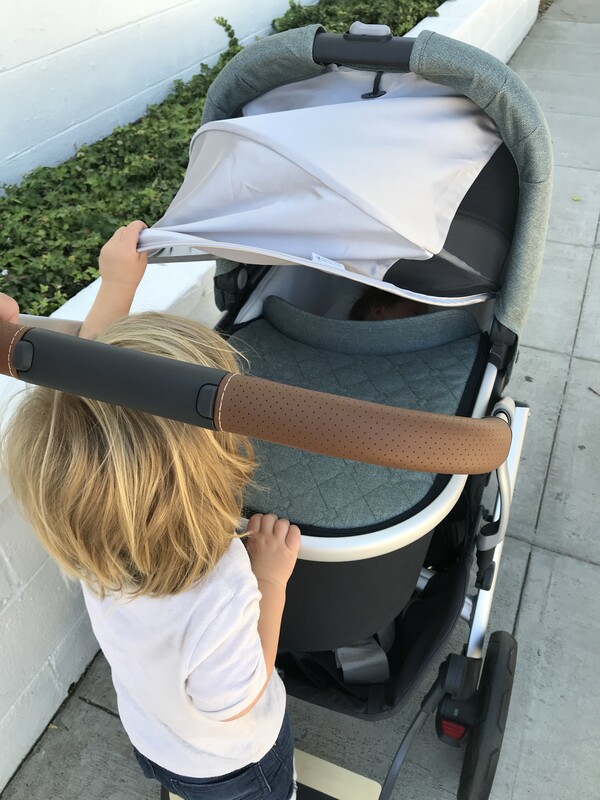 I opted for the 2018 UPPAbaby VISTA in Emmett (which is gorgeous BTW!). It has Green Melange fabric with a Silver frame and Leather handle bar. It arrived just before baby E made her unexpectedly early debut, and we have been using it since our very first family walk after leaving the hospital. In the past 5 years I have acquired an arsenal of strollers from all-terrain singles, double joggers, and another brand’s high-end bassinet to toddler seat stroller. I’ve checked out friends’ strollers and coveted strangers’ strollers. And I can honestly say that so far, my fave is the UPPAbaby VISTA. Choosing the ‘right’ stroller is a very personal thing. It depends on your lifestyle, your kids’ ages and where you live. 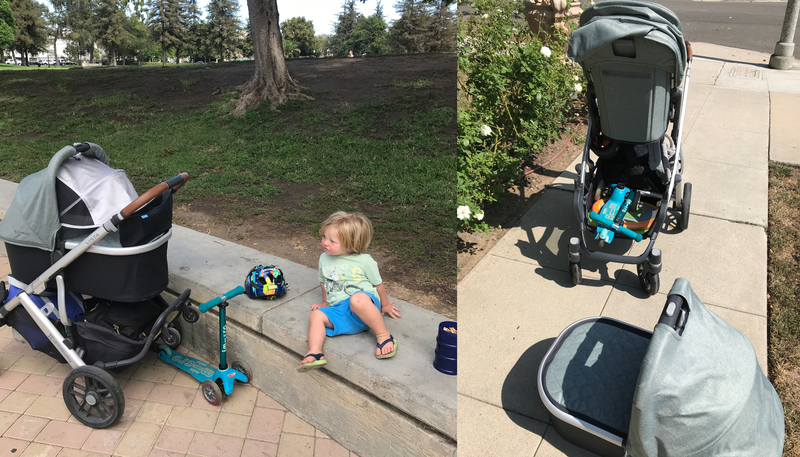 If I were to make any recommendation to any new mom it would be to invest in a high quality stroller – especially if like me, you do a lot of walking and spend a lot of time outdoors. While I still plan on using my double jogging stroller once baby E is old enough, the UPPAbaby VISTA is hands down my first choice right now for my current needs for many reasons. First of all, the stroller is insanely easy to put together and absolutely gorgeous. 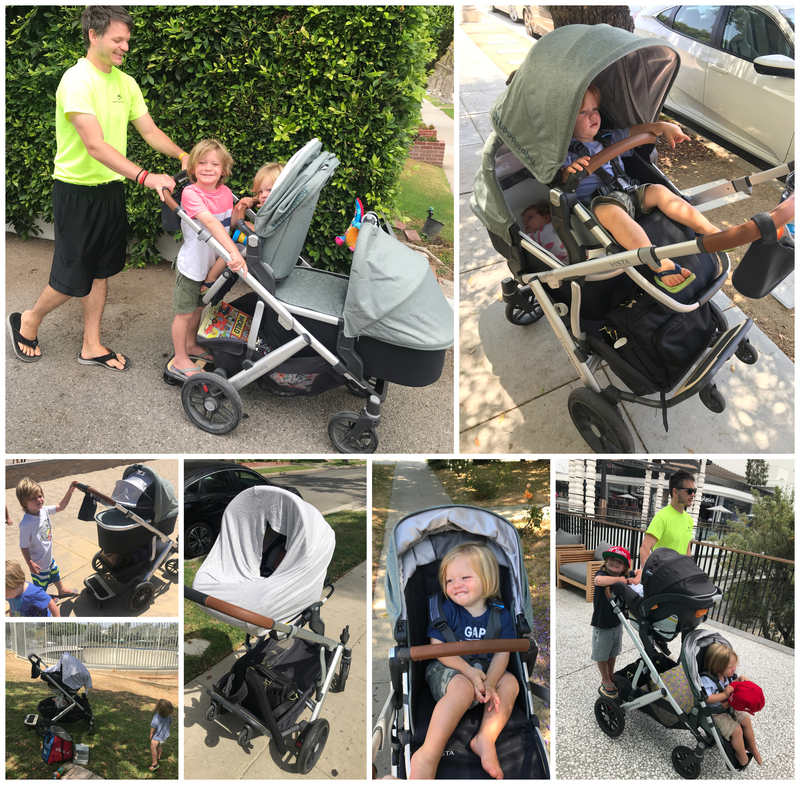 Seriously, I get compliments on it all the time – which isn’t the main reason to get a stroller, but it does make you feel good especially when you feel like a crazy person taming a pack of wildebeasts. Even if you fall in love with the ‘form’ of the stroller, its ‘function’ is where it really shines. I bow down to the magic of the UPPAbaby VISTA basket. The amount of stuff you can cram in there is nothing short of a magic hat trick. I mean seriously. I have had 5 different strollers, all of which boast great storage; but none come close to the VISTA’s. For example, I can easily fit my diaper bag, my Tula baby carrier, two Micro Scooters, two helmets, a bag of sand toys, a picnic blanket and a cooler bag full of snacks and lunches underneath. And I’m not talking crammed in there pouring out the sides threatening to rip and tear the basket fabric. I can legit comfortably fit all those things. I also love that the back of the basket is flexible so when you do overpack the basket, you can get bulky things like the diaper bag out easily without looking (and feeling) like you are in a pig wrestling match. Now, I will be honest, I was not sure I would be a fan of the bassinet…but baby E LOVES the bassinet, and in turn, so do I! I always thought, what do you REALLY need one of those for…and the answer is EVERYTHING. Aside from giving her a cozy place to ride that doesn’t involve buckles (because buckling a fragile little newborn into anything is not fun), as baby gets older she can kick and wiggle to hear hearts content, sleep swaddled and enjoy napping on-the-go without the peace of mind that she’s sleeping in a safe spot. We have used it on vacation for her to sleep in. We took her camping and had her sleep safely and soundly in the bassinet. She naps in it both inside the house and outside. She hangs out in it at the park and in our front yard while the boys play. 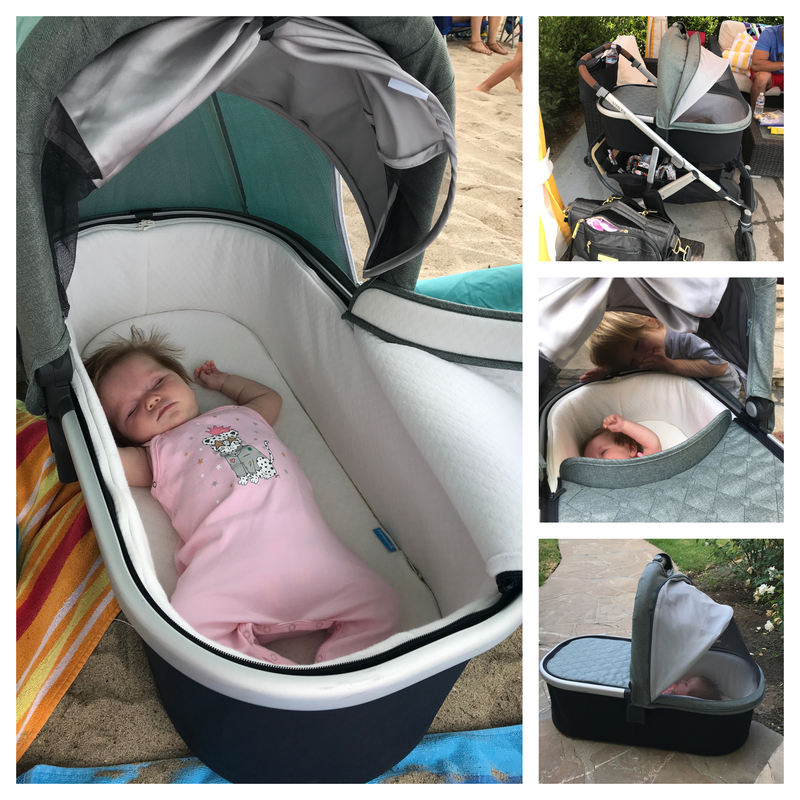 She naps in the VISTA bassinet on the stroller, at the beach, by the pool, you name it. It’s so nice to know whether we are going to a playdate for the boys, a day trip or a weekend getaway, all we have to have with us is our UPPAbaby VISTA stroller and we also have a safe place for her to sleep. The number one reason I got the UPPAbaby VISTA was for its versatility. UPPAbaby markets the VISTA as ‘One for all’ and it really is. I really wanted a stroller that I could use whether I had 1,2 or all 3 kids with me. With 2 kiddos, I had a double and a single stroller and would have to trade them out of the car depending on what I thought I ‘might’ need that day. I was constantly switching strollers and often left without the best stroller for whatever situation the day presented. So, when I was looking for a new stroller that would work from newborn and beyond with baby number three, it was really important that I found something that was versatile. I already had a double jogging stroller, so I knew I didn’t want a tandem stroller. I instantly fell in love with the idea of the UPPAbaby VISTA. I could have ONE stroller in the car and be able to adapt it for 1,2 or 3 kids. In order to have as much versatility as possible, I went ahead and got the RumbleSeat as well as the adaptor for my Chicco KeyFit Infant Carseat, Upper and Lower Adaptors and the PiggyBack Ride Along Board. Now I can pop the infant seat into the frame and run quick errands with one kiddo, or put my toddler on the ride on board and the baby in the bassinet for a stroll around the block, or put the toddler in the toddler seat and the baby in the bassinet for longer walks when I need them both strapped in. And if I have all three with my I can put my 4 year old on the PiggyBack, baby in the bassinet and toddler in the toddler seat. I think we have used every different configuration (and there are SO many) of toddler seat, PiggyBack and Bassinet or Car Seat with Adaptor. And now that baby E is 3 months, I’m excited to explore all the options with the RumbleSeat! There are so many strollers out there, and I have tried most of the more popular brands. If you have two (or three) kids close in age, the UPPAbaby VISTA is a great option. And even if it’s your first, I would strongly recommend a stroller that can grow with your family – especially a high quality stroller that will last through multiple kids. The price tag may seem overwhelming, but having a high quality stroller that works FOR you and your life will be monumental in helping you feel confident easily leaving the house. I love that no matter what we have planned for the day I feel like I can be remotely pulled together and have all three kids contained easily. Would you mind sending me a picture of your stroller with both seats on? I can’t find a photo that’s not a stock one and I’d love to see it in true color. Thanks! Absolutely! You can also just go to my Instagram @rockinmamalife and there are several photos on there as well.